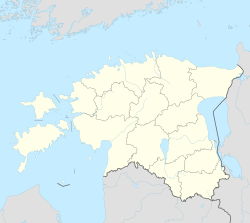 Rakvere (German: Wesenberg or Wesenbergh) is a toun in northren Estonie an the coonty seat o Lääne-Viru Coonty, 20 km sooth o the Gulf o Finland. ↑ "Twin Cities". Rakvere. Retrieved 30 April 2014. ↑ "INTERNATIONAL COOPERATION". panevezys.lt. Retrieved 27 April 2014. This page wis last eeditit on 11 Mairch 2018, at 15:40.